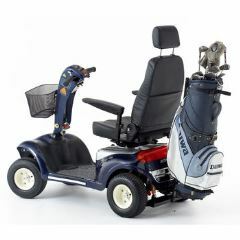 The Shoprider 889GOLF mobility scooter has been designed to take on the challenges of the Golf course while providing the reliability and comfort of the Shoprider range. The 889 GOLF comes with wide tyres 330 x 120, 2.0hp High torque motor, High back seat and all the features you expect from the SHOPRIDER range, Fully rotating lockable seat, suspension, adjustable steering tiller and multi position fold down arm rests. The reliability of this impressive scooter by SHOPRIDER is further enhanced by the rear wheel drive and electromagnetic brake. Features Include: T Bar Tiller / Adjustable Rear Lights Indicators Battery Power Indicator Twin Headlights Hazard Lights High Back Comfort Seat Sliding / Rotating Seat Front and Rear Suspension High and Low Speed Width Adjustable and Lift Up Arm Rests Battery Level Warning Light Large Battery Capacity Golf Bracket can be fitted (Optional extra) Maximum user capacity on flat level ground: 225kg WARNING: The legal speed limit in most states in public areas is 10Kph. 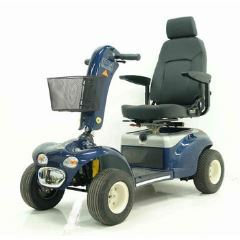 The scooter is set up with a Hi/Lo switch which set to low will meet the legal requirements.